Can I select my LOCAL NUMBER (DID)? You can select to purchase any Local Number (DID) directly from the EVCMOBI mobile app or from your PC customer portal " myaccount". Simply select the country, city and the desired number. The application checks in real time the availability of the numbers. We also offer Vanity numbers for certain countries. Note that if you want a number that is not currently listed in our system, send us an email with your request and the desired number. What is a Local Number (DID)? What does a Local Number (DID) offer me? Can i use my LOCAL NUMBER (DID) as my caller id when i make a call? How can i receive calls from both EVCMOBI users and NON EVCMOBI users? What is the "Find me" feature, in my customer portal (MY ACCOUNT)? How do I check the service rates and charges? How can i top-up my EVCMOBI account? How do I select a plan or bundle? In what ways can I use my EVCMOBI account? What type of services are offered through the customer portal (MY ACCOUNT)? Does it cost anything to use "EVCMOBI"? 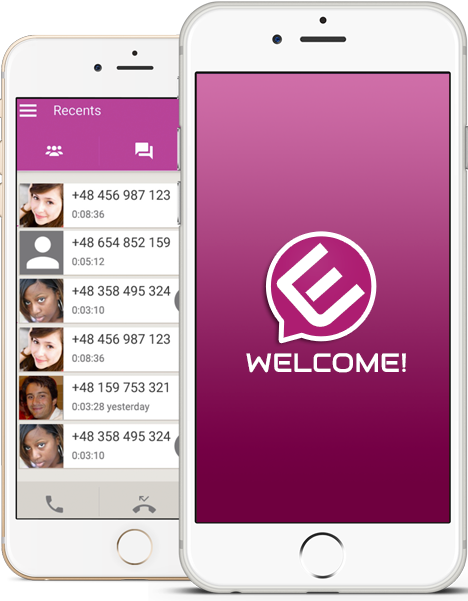 What is the EVCMOBI PC softphone? What's the Home Service and how can I use EVCmobi as a home service? I do not have internet or wifi signal, how can i make a call using EVCMOBI ? Sometimes I hear slight echoes or buzzing during a conversation, what's wrong? How do i make calls to someone who does not have EVCMOBI like a business landline or someone in another country? How do I use EVCMOBI? Download EVCMOBI from GooglePlay or the Appstore. Follow the steps by adding your country and mobile number. Enter the verification code in the appropriate field. The entire process takes just under 1 minute. Add funds to your account (topup). Select one of our attractive plans or pay-as-you-go. Call anywhere and anyone world wide at the lowest rates. Get updates on our latest news and offers! We will not spam you! That's a Promise! All the platforms that are used by EVCMOBI have won the following awards. Download EVCMOBI for smartphones. Enjoy the full support of all features.